The Expert Advisor works with ticks, calculates volatility and operates in the volatility working range. After that, the EA defines price deviation from the price balance level and starts working in the direction set in the input parameters and on the appropriate levels that are also specified in the inputs. Setting (by default) is displayed in the screenshot (2014.01.01-2014.11.01). Before working in real time, optimize a month on every tick! The optimization setting is provided. It is enough to optimize the EA once per month, for example. After that, it shows excellent results on the forward period (up to a year). 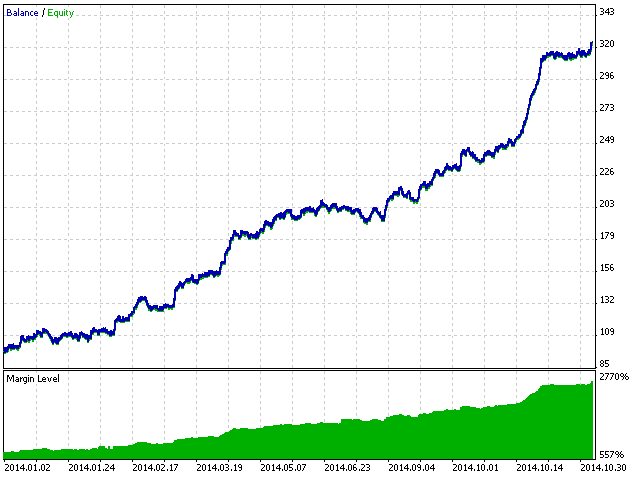 Also, it is recommended to work on liquid Forex pairs with low spreads and use VPS. The minimum starting deposit is $100 and the minimum lot is 0.01. Backtest is not the same as real performance.